We recently had an opportunity to visit the Southern Living Idea House in Bluffton, SC. The house was approximately 30 minutes from Savannah, GA and 30 minutes from Hilton Head, SC. This is beautiful part of the United States and one that is growing with more and more homes under construction. Yet no so many that a peaceful environment is still very prevalent. The home had an elegantly easy feel to it with front porches and back verandas with access to a lake. The exterior of the house used plank siding with a white paint added. While the interior of the home, use a pure white by Sherwin-Williams on the walls, ceilings, trim and doors. There were other colors inside the house like grays and subtle blues on the walls and ceilings depending on the room. The home’s colors both inside and out reflected a bright and clean feel. A feeling of being on a vacation. The furnishings and accent pieces added to the feeling of relaxation of the house with creams, whites, grays, and blues. While brighting the home by leveraging accent pieces like orange, red, navy and black in small and specifically defined areas. The use of these colors both on furnishings, draperies and accent pieces kept to the tone of the house while reminding those that entered that this was also going to be a place of fun. The use of woods was prominent on the floors, the chairs, tables, and even outside in the backyard area with some of the furnishing. The woods were different shades of colors which created a distinction as you entered some rooms. Additionally, the furniture pieces continued with a theme of natural and easy. The more you walked through this home, you felt at home and rested. This home provided so many tools to help a homeowner leverage more of the space. Electrical outlets were located on the baseboards rather than the walls to allow for more wall space for other items. Lennox Industries provided the heating and cooling system which allowed you to modify via a touchscreen while Nest Labs provided the smoke and carbon monoxide detectors. The outdoor lighting used gas powered lights from Bevolo which seems to be a trend in the Palmetto area of South Carolina. The layout of the house was very functional. With a lot of open spaces, multiple doors to access multiple areas of the home, and creating usable spaces out of areas that might be considered unusable. The lower level had bedrooms and an open area that had multiple sitting areas to create gathering spaces for multiple groups of people at one time. Kitchen cabinets were in a variety of spaces to maximize the limited wall space in the kitchen due to the openness of it. A separate room off the kitchen to act as a pantry, additional work space, gardening space or craft space had lots of extra room for hobbyists. This room had plenty of extra space for storage which also helped with the openness of the kitchen. Upstairs, open space was turned into additional seating areas and the use of barn sliding doors allowed for more space for shoes in master closets. Even turning a sight space of a room into a great little bunk area for some youngsters to sleep was how this team maximized every area of this home. Bluffton is an outdoor kind of area and finding bikers along the road and paths is common. So incorporating the openness and functionality of this house to the outdoors continued to the theme of making you feel relaxed at this home. The outdoor areas had multiple seating areas but all linked by a common location. Burpee Home Gardens helped design the outdoor areas with specific weather tolerant plants. These gardening techniques and design were able to help make the house feel like it grew from the ground as it fit into the area nicely. 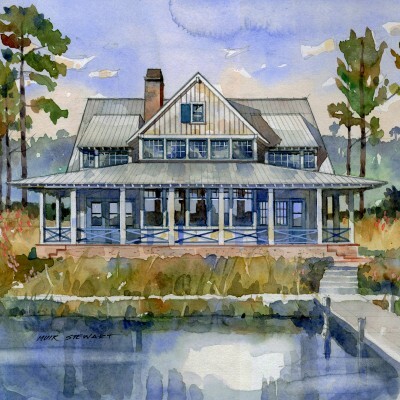 This Idea House was highlighting the easy feel of a southern home where many people might vacation. Along with that easy feel, was a sense of elegance and friendliness which depicts this area of the South to a tee. If you are in the area, a visit to this home might have you thinking of getting a property in this area.